I was somewhat reluctant to click the publish button on this post . 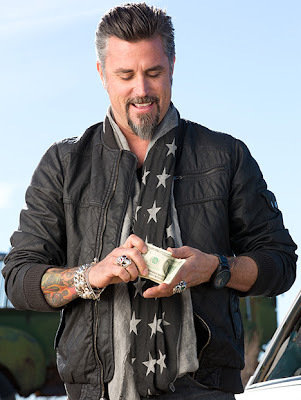 . . but in the interest of full disclosure, I thought I should tell you: I am a huge fan of Fast N’ Loud. There, I said it! 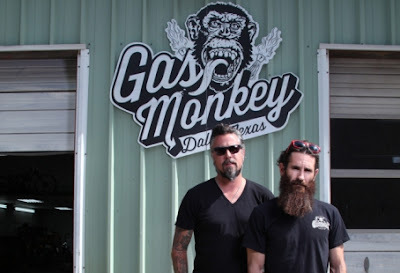 Most days I would rather watch Downton Abbey or some other BBC costume drama, but the guys at Gas Monkey Garage are hysterical. Generally the only reality television I can be bothered to watch is So You Think You Can Dance and Dancing with the Stars. And this week Emmitt Smith’s Mercedes was on the show – how is that for synchronicity?! Now we just need to get those boys on Dancing with the Stars next season! But I am beginning to see why I am drawn to the show. Imagine a fashion house. There are the backers with all of the cash, the artist who has a vision, plenty of grunt workers who do the heavy lifting, and the consumer who is obsessed with the finished product. Richard is the one with the money, as evidenced by the wads of cash he is always throwing around - I have a sneaking suspicion that most of that cash goes to the purchase of hair gel, pomade, and sterling silver skull jewelry. Aaron has the artistic vision to bring some old rust buckets back to life - the ultimate re-fashioner. He also recently said about the new garage space, “ . . .it’s like closet space, if you build it, you’ll fill it.” Oh, my god, this man is my soul mate! 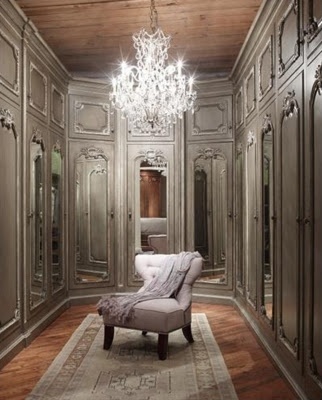 Would someone please build me this closet? I promise, I will fill it with lovely things! Each week more mechanics seem to appear, and mayhem ensues. Although, the objectification of women is becoming a bit disconcerting, and unfortunately, a bit more prevalent in the second season. So now that I got that off my chest, I am going to stop feeling guilty for watching a bunch of grease monkeys mess around with a bunch of rusty old cars while I knit and sew with silk. Do I now have an urge to change the oil on my car? That would be a resounding, NO! But I can certainly appreciate the work and all of the effort that goes into their finished projects. By the way, does anyone else want to know what Aaron looks like without that beard? My boss recently mentioned how great Storage Wars is! I also like Property Wars for the house reveals, but the arguing between the buyers is a bit off-putting (perhaps it is exaggerated for the cameras?). I will keep my eyes open for those other shows! My hubbs and I love this show! And bearing sea gold.... Eekkk secrets out! This is the same way I felt about the first season of American Chopper (before it became about fights instead of motorcycles). I have zero interest in motorcycles but enjoyed the creative process. My current creativity hit is FaceOff. Watching the artists at work is great but I also enjoy the judges explaining why something works or doesn't. Comments on color choice or reminders that items are seen from all angles make me think about my sewing choices. I just knew I could not be the only one! And that beard really is crazy - it does look like it is glued on! What makes it so funny is how short his haircut is; I would expect him to have hair longer than mine to match. Sorry ma'am, but my husband has made us a nice retirement from being a grease monkey. Where he worked for 24 years, we now own. Please don't sterotype. I thought you were above that. I apologize if I offended you, but I believe it is quite clear that I love the show and think that the men are smart, funny, and talented. I could do without the silly waitresses parading through the garage wearing next to nothing, and the rear shots of the new welder, but having grown up visiting my fair share of lumber yards and auto garages, I realize that scantily clad women (on calendars or otherwise) are par for the course. As a girl who both sews, and messes around with rusty old cars.... (I have more rusty old cars then sewing machines.). I too, love this show. I think there is a good bit of staging going on, but I like looking at the cars. I haven't watched the two last episodes, since I watch them with my husband, but I've read a few bits on Facebook about a girl, so I'm skeptical about how they portray a female into cars. I am sure you are right - "reality" television is very staged! The new girl is a welder (I think her name is Alloy). To their credit, they have mentioned that she is quite talented in that respect, but the show seems to be focusing on the fact that she is very attractive and does not know very much about old cars. Hopefully they will begin to show off her talent as a welder and stop ogling her backside. I super duper love Richard & Aaron!!! Great show. Boy do I have something for you that I somehow found, The Great British Sewing Bee. You can find it on YouTube. So much better than Project Runway! I thought I was the only one who liked that show!! 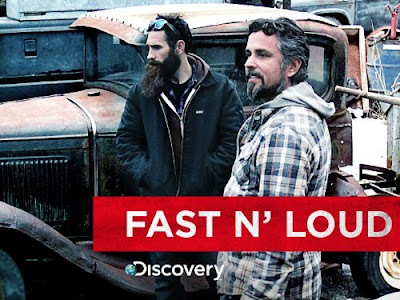 I watched 4 episodes back to back and was dying for more : ) I used to own a 56 Chevy and if those boys lived closer I'd buy a car from them.